If you would like to read the scriptures along with this article, click here to open the Blue Letter Bible www.blueletterbible.org in a separate window. My primary reference in the area of Tithes and First fruits offerings (other than the Old Testament) was The Jewish Encyclopedia, which you can see at www.jewishencyclopedia.com. There seems to be a certain set of teachings that, with some variation, get recycled over and over in "giving sermons" that are preached in the large, corporate "mega" churches in America, and for all I know in other parts of the world too. Now, it’s against my policy to name specific churches or denominations, and it’s really not necessary because my objective is to examine these teachings themselves in light of scripture. The teachings I’m going to discuss below came from two particular sermons (a representative sample of "mega" churches). One sermon is from a "mega" church that is the fastest growing church in a major metropolitan area, and the other is from a church headed by someone whose name is known to most everyone in the United States. Ironically, this sermon was discovered by accident. I stumbled on the sermon using a search engine, and only after I read the sermon (and was shocked by what I read) did I go up to the "home page" of the church and discover whose church it was. In putting this episode together, I couldn’t decide whom to be angrier with, the celebrity preachers who preach this stuff, or the multitudes who just sit there and listen without questioning what they’re being taught. I’m writing this in the hope that one or two out there may gain some understanding. Below I’m going to analyze several characteristics of a standard "giving sermon." First: The relative proportion of Jesus’ teachings concerning money, as opposed to any other topic, is overstated. In one of my two sermon samples, the preacher says at the outset that 10% of the proverbs relate to money, and that 25% of Jesus’ teachings relate to money. In the other sample, the preacher says that Jesus taught more parables about money than any other topic, and that Jesus talked "more about giving money to God than He did about heaven and hell put together." This makes it sound like there is a ton of scripture, and red-letter stuff at that, backing up what the preacher is about to tell you about giving. Is this really true? To answer this question, I went through the entire book of proverbs and the four gospels. Here is what I found. There are about 595 proverbs of Solomon. I found 51 that "relate to money" somehow. Many of these mention "poor" or "rich" in some context. For example, Proverbs 23:4 says "Labor not to be rich…"
I found six proverbs that are explicit directives concerning money. In other words, they tell exactly what to do with our money. Two explicitly encourage giving to the poor. One commends the man who leaves an inheritance to his children’s children. Two encourage generosity in general. One is Proverbs 3:9 which says, "Honor the LORD with thy substance, and with the firstfruits of all thine increase." More on that one below. So, when it comes to explicit directives concerning what we are to do with our money, the figure for proverbs is about 1%. But that was just the warm up! Then I had to go through all the teachings of Jesus. And, what exactly is a "teaching" anyway? Sometimes it’s hard to tell where one "teaching" ends and another begins. It’s a rather subjective process, and I don’t think any two people would come up with the same answer for the percentage of Jesus’ teachings that relate to money. Still, someone said 25%, so I wanted to see what kind of number I would come up with. 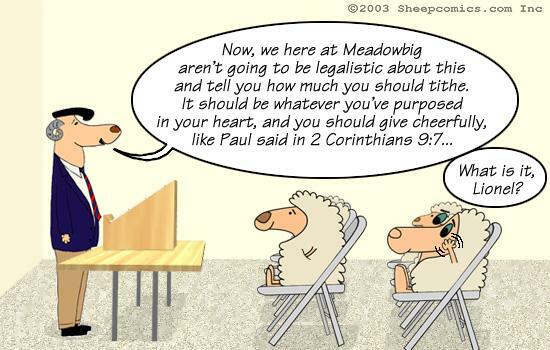 And, since the preacher is telling me exactly what to do with my money, I particularly wanted to see where Jesus tells us exactly what to do with our money. As one preacher said, "Because your use of money reflects who you are in life." How does Jesus want us to use our money? Before I begin, I did not count every teaching that contained a mention of money or wealth as "related to money." For example, I did not count the parable of the talents as "related to money" because what this parable is about is what we do with our lives and how our lives will be judged. The various amounts of money, or "talents" are simply the way Jesus chose to illustrate the way our lives will be evaluated. Monetary investing is used to illustrate the point, but it is not the point that Jesus is illustrating. In the book of Matthew I counted 105 "teachings" according to my subjective method. Two of these teachings were explicit, specific directives concerning what we are to do with our money. We are to give to the poor and the needy. 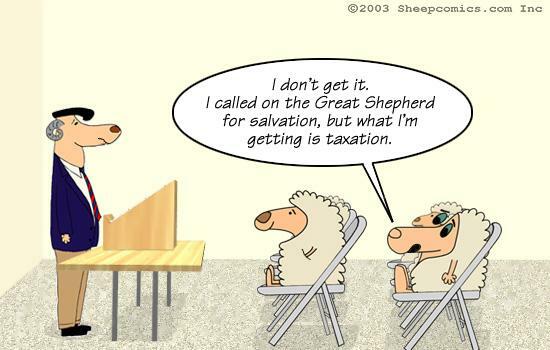 One was "Render unto Caesar…" about paying taxes. 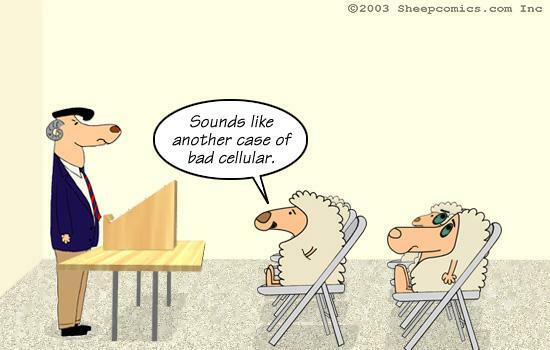 The other was the parable of the sheep and the goats (obvious enough for me). Four teachings out of 105 represent about 4%. Just to be thorough, I counted the number of "teachings" that mention monetary concepts in any way and I got 17. 17 out of 105 is about 16%. In the book of Mark I counted 41 "teachings." Two of these teachings were explicit and specific concerning our use of money. One was "Render unto Caesar…" about paying taxes. The other was the Rich Young Ruler who was commanded to give to the poor. Two teachings out of 41 represent about 5%. Just to be thorough, I counted the number of "teachings" that mention monetary concepts in any way and I got 9. 9 out of 41 is about 22%. In the book of Luke I counted 84 "teachings." Four of these teachings were explicit and specific concerning our use of money. One was "Render unto Caesar…" about paying taxes. Four others were explicit commands to help those in need. Five teachings out of 84 represent about 6%. Just to be thorough, I counted the number of "teachings" that mention monetary concepts in any way and I got 20. 20 out of 84 is about 24%. In the book of John -- which was by far the most difficult when it came to counting "teachings" – I counted not a single teaching related to money. I was quite surprised by this. Just for fun, let’s total all the teachings (including duplicates) and see what percentage relate to money. And by "relate" I mean that they simply have to mention a monetary concept in any way to be counted. We have a total of 46 teachings that "relate" to money out of a total of 282 teachings (including John). 46 out of 282 represents 16%. So, are 25% of Jesus’ teachings related to money? I guess it depends on how you define "related to money." Did Jesus talk more about "giving money to God" than about heaven or hell? No. Jesus didn’t talk about "giving money to God" at all. We can’t give money to God! But we can please God in the way we use our money. Jesus talked about giving money to the needy and paying our taxes. Did Jesus tell more parables about money than any other topic? Do we decide that simply because monetary concepts are used in a parable that the parable is "about money?" I did a survey of 34 different parables (I think I got them all) to see how many were "about money." I counted two: the Shrewd Steward, where Jesus admonishes to use mammon to make friends for eternal dwellings, and the Sheep and the Goats, where helping those in need is directly tied to our eternal destiny. I counted three parables about joy in Heaven over a sinner who repents. They’re all in the same place in Luke 15. These are The Lost Sheep, The Lost Coin, and The Prodigal Son. How about those parables where Jesus spoke of His return and of judgement? We have: The Wheat and the Tares, The Unmerciful Servant, The Wicked Husbandmen, The Wedding Garments, The Ten Virgins, The Talents, The Sheep and the Goats, The Growing Crop, The Man Taking a Far Journey, The Watchful Servants. So, where would anyone get the idea that Jesus spoke more parables about money than any other topic? Second: We are taught that Jesus actually receives our tithes. Probably the most shocking discovery I made while doing the research for this editorial is that some preachers out there actually teach that we tithe directly to Jesus based on Hebrews chapter 7. There was an order of priests, and a certain priest named Melchisedec. The priesthood of Israel tithed to this priesthood through Abraham. Therefore, the priesthood that is of the "order of Melchisedec" is greater than the priesthood that is of the "order of Aaron." Jesus is a priest of the "order of Melchisedec". Therefore, Jesus’ priesthood is of a "better testament." How many times would I have to read Hebrews 7 in order to see that I’m tithing to Jesus? 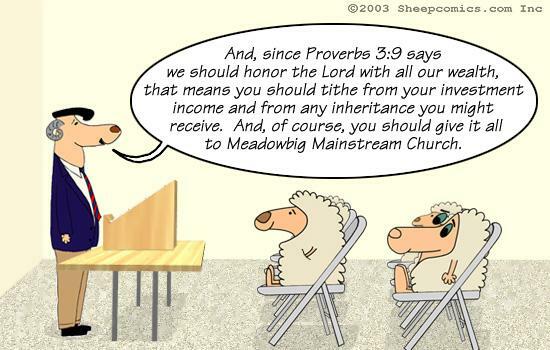 To me, this "Jesus receiving our tithes" teaching is just a self-serving abuse of scripture to get money. Third: The Old Testament doctrines of tithing and firstfruits are confused and then applied to the Christian. According to the "orthodox" tithing doctrine of today, we are supposed to tithe based on our gross income because in Israel they gave the "firstfruits." One doesn’t have to be much of a scholar to do a little Old Testament reading and see that the tithe and the offering of the "first fruits" were two separate concepts. The "firstfruits" offerings were not part of the tithe. We first see an explicit reference to giving the "firstfruits" in Exodus 23:19, where the Israelites are commanded to bring the "first of the firstfruits" into the house of the Lord. This seems to mean the best of the first round of harvesting of each crop. No exact proportion is specified. This is repeated in Exodus 24:26. In Leviticus 2:12-16, we have commands concerning the exact mechanics that were to surround an offering of "firstfruits." In Leviticus 23:10, the "children of Israel" are commanded to bring a sheaf of the first fruits of their harvest to the priest. The priest offers this as a waive offering before the God on the day after the Sabbath. A place where we see the concept of "firstfruits" and tithing come together is in Numbers 18. In Numbers 18:12-13 God tells Aaron that the "firstfruits" – the best of the oil, wine, and wheat – have been given to him and his house. Also, he has been given whatever is "first ripe" in the land. In Numbers 18:24 we see that the "tithes" of the children of Israel were given to the Levites. In Numbers 18:26 to 30, we see that the Levites were to offer 10% of the tithes they received from the Israelites to the priests of the house of Aaron. Not just any 10%, but the best. This explains how Aaron got the "firstfruits" back in Numbers 18:12. The last place we see "firstfruits" in the Law of Moses is in Deuteronomy 26. 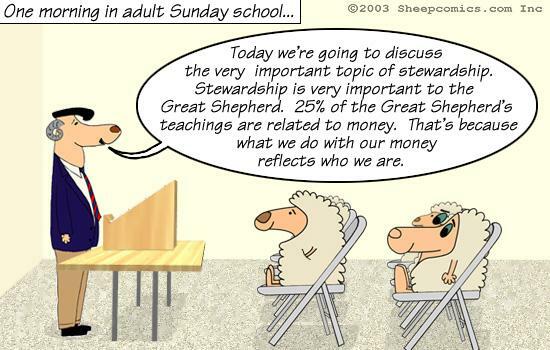 We see tithing here too. In Deuteronomy 26:12-15 we have the exact words an Israelite is to say after they have completed their "third year" tithe. This is the one that is stored up in the gates of their towns for the Levites, the fatherless, the stranger, and the widow. In summary, one thing I’ve learned from my study is that probably nobody knows exactly how all the transfers of wealth from the Israelites to the priests and Levites worked. However, I feel very safe in my determination that the "firstfruits" and the "tithe" were not the same thing. They represented separate transfers of wealth. Fourth: Paul is made to seem as if writing about tithing. Often toward the end of a "giving sermon" the preacher will pose the question, "So, how much should I tithe?" Then the Apostle Paul’s admonition in 2nd Corinthians 9:7 is quoted to illustrated that we should give "cheerfully" and not under compulsion. The problem here is that Paul never answered the question as to how much we should tithe because Paul never mentioned tithing. Two entire chapters in 2nd Corinthians (8 and 9) are taken up by Paul’s description of his fund raising efforts for the needy in Jerusalem. (See 1 Corinthians 16:1-4 for the beginning of the story). The preacher quoted a more modern translation, but either way it doesn’t justify what happened next. This preacher actually used this passage as a prooftext to show that we should tithe not only our gross income, but also all our investment income as well, and inheritances! This goes way beyond the Law of Moses. I didn’t read anything in the Law of Moses that indicated that if a father left a field to his son, that the son had to figure out what 10% of the value would be and give it to the Levites. I didn’t read anything that said that if someone sells or rents a field to another until the Year of Jubilee that the income from that arrangement had to be tithed. 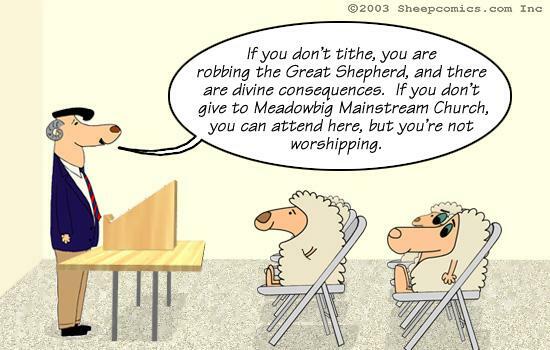 So, in some churches the leadership is promoting a tithing doctrine that actually takes money from the Christian in a way the Law of Moses did not take it from the children of Israel. What many churches have done in their teachings about giving is neither Old or New Testament, but rather a self-serving law comprised of fragments from each. I doubt that many Christians are ever taught the details of how tithing and "firstfruits" worked under the Law of Moses, and I doubt they’re taught the details of Paul’s fund raising activity that he describes in his letters. Finally, I just wanted to say that I personally don’t tithe and never have. I honestly don’t believe God has cursed me in my finances. I’ve never run out of money in my life. I have never been involuntarily unemployed. I have job security, and more than enough income to take care of my household. All my financial setbacks I can take credit for myself because they were due to my own stupidity. If anything, I’ve been given grace that I don’t deserve. And, I might have been blessed more if I had been more generous. This is part of my life I want to change because I’ve studied the scripture, not because I blindly follow anyone who can preach a slick "giving sermon."